The project involved researching the previous Victorian school with students, asking 'what matters' or what 'matter' the site contains, to build an 'open pavilion' outdoor learning and recreation zone. 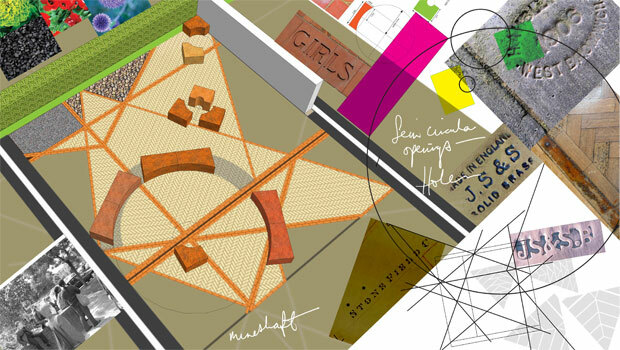 Work progressed to a paving pattern with formal and informal seating areas, reinterpreting colours, curves, angles and memories of the building. 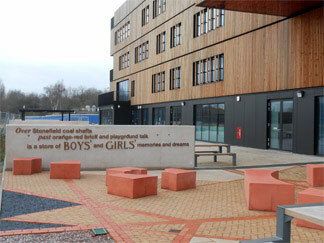 Poetic text was collaboratively shaped from fragments of found signage, conversation snippets and archive material relating to the school grounds, in a copper finish that also begins to subtly connect George Sankey's (of Joseph Sankey and Sons) involvement with the original school build, back to the site. I also undertook a site supervisory and organisation role from the commencement of site works, working closely with contractors through to the project's completion.